Not to be confused with Enrico Malatesta. Errico Malatesta (14 December 1853 – 22 July 1932) was an Italian anarchist. He spent much of his life exiled from Italy and in total spent more than ten years in prison. Malatesta wrote and edited a number of radical newspapers and was also a friend of Mikhail Bakunin. Errico Malatesta was born to a family of middle-class landowners in Santa Maria Capua Vetere, Italy (in the province of Caserta) on 14 December 1853. More distantly, his ancestors ruled Rimini as the House of Malatesta. The first of a long series of arrests came at age fourteen, when he was apprehended for writing an "insolent and threatening" letter to King Victor Emmanuel II. Malatesta was introduced to Mazzinian Republicanism while studying medicine at the University of Naples; however, he was expelled from the university in 1871 for joining a demonstration. Partly via his enthusiasm for the Paris Commune and partly via his friendship with Carmelo Palladino [it], he joined the Naples section of the International Workingmen's Association that same year, as well as teaching himself to be a mechanic and electrician. In 1872 he met Mikhail Bakunin, with whom he participated in the St Imier congress of the International. For the next four years, Malatesta helped spread Internationalist propaganda in Italy; he was imprisoned twice for these activities. Following Bakunin, Malatesta became a freemason at Naples on 19 October 1875, hoping to influence younger members. However, when the lodge organised a reception honouring Giovanni Nicotera, the Interior Minister, Malatesta left on 18 March 1876 and became anti-Masonic. In April 1877, Malatesta, Carlo Cafiero, the Russian Stepniak and about thirty others started an insurrection in the province of Benevento, taking the villages of Letino and Gallo without a struggle. The revolutionaries burned tax registers and declared the end of the King's reign and were met by enthusiasm. After leaving Gallo, however, they were arrested by government troops and held for sixteen months before being acquitted. After Giovanni Passannante's murder attempt on the king Umberto I, the radicals were kept under constant surveillance by the police. Even though the anarchists claimed to have no connection to Passannante, Malatesta, being an advocate of social revolution, was included in this surveillance. After returning to Naples, he was forced to leave Italy altogether in the fall of 1878 because of these conditions, beginning his life in exile. Prominent French anarchist Élisée Reclus (1830–1905), a friend of Errico Malatesta. He went to Egypt briefly, visiting some Italian friends but was soon expelled by the Italian Consul. After working his passage on a French ship and being refused entry to Syria, Turkey and Italy, he landed in Marseille where he made his way to Geneva, Switzerland – then something of an anarchist centre. It was there that he befriended Élisée Reclus and Peter Kropotkin, helping the latter to produce La Révolte. The Swiss respite was brief, however, and after a few months he was expelled from Switzerland, traveling first to Romania before reaching Paris, where he worked briefly as a mechanic. In 1881 he set out for a new home in London. He would come and go from that city for the next 40 years. There Malatesta worked as an ice cream seller and a mechanic. Malatesta's mistress in the 1870s, Emilia Tronzio, was the step-sister of the internationalist Tito Zanardelli. With Malatesta's consent and support she married Giovanni Defendi, who came to stay with Malatesta in London in 1881 after being released from jail. Malatesta attended the Anarchist Congress that met in London from 14 July 1881. Other delegates included Peter Kropotkin, Francesco Saverio Merlino, Marie Le Compte, Louise Michel and Émile Gautier. While respecting "complete autonomy of local groups" the congress defined propaganda actions that all could follow and agreed that "propaganda by the deed" was the path to social revolution. With the outbreak of the Anglo-Egyptian War in 1882, Malatesta organized a small group to help fight against the British. In August, he and three other men departed for Egypt. They landed in Abu Qir, then travelled towards Ramleh, Alexandria. After a difficult crossing of Lake Mariout, they were surrounded and detained by British forces, without having undertaken any fighting. He secretly returned to Italy the following year. In Florence he founded the weekly anarchist paper La Questione Sociale (The Social Question) in which his most popular pamphlet, Fra Contadini (Among Farmers), first appeared. Malatesta went back to Naples in 1884—while waiting to serve a three-year prison term—to nurse the victims of a cholera epidemic. Once again, he fled Italy to escape imprisonment, this time heading for South America. He lived in Buenos Aires from 1885 until 1889, resuming publication of La Questione Sociale and spreading anarchist ideas among the Italian émigré community there. He was involved in the founding of the first militant workers' union in Argentina, the bakers union, and left an anarchist impression in the workers' movements there for years to come. Returning to Europe in 1889, Malatesta first published a newspaper called L'Associazione in Nice, France, remaining there until he was once again forced to flee to London. The late 1890s were a time of social turmoil in Italy, marked by bad harvests, rising prices, and peasant revolts. Strikes of workers were met by demands for repression and for a time it seemed as though government authority was hanging by a thread. Malatesta found the situation irresistible and early in 1898 he returned to the port city of Ancona to take part in the blossoming anarchist movement among the dockworkers there. Malatesta was soon identified as a leader during street fighting with police and arrested; he was therefore unable to participate further in the dramatic industrial and political actions of 1898 and 1899. From jail Malatesta took a hard line against participation in elections on behalf of liberal and socialist politicians, contradicting Saverio Merlino and other anarchist leaders who argued in favor of electoral participation as an emergency measure during times of social turmoil. Malatesta was convicted of "seditious association"and sentenced to a term of imprisonment on the island of Lampedusa. He was able to escape from prison in May 1899, however, and he was able to make his way home to London via Malta and Gibraltar. His escape occurred with the help of comrades around the world, including anarchists in Paterson, New Jersey, London, and Tunis, who helped arrange for him to leave the island on the ship of Greek sponge fishermen, who took him to Sousse. In subsequent years Malatesta visited the United States, speaking there to anarchists in the Italian and Spanish immigrant communities. Home again in London, he was closely watched by the police, who increasingly regarded anarchists as a threat following the July 1900 assassination of Umberto I by an Italian anarchist who had been living in Paterson, New Jersey. By 1910 he had opened an electrical workshop in London at 15 Duncan Terrace Islington and allowed the jewel thief George Gardenstein to use his premises. On 15 January 1910 he sold oxyacetylene cutting equipment for £5 (£500 at 2013 monetary values) to George Gardenstein so that he could break into the safe at H.S.Harris jewellers Houndsditch. Gardenstein led the gang that mounted the abortive Houndsditch robbery that is the precursor to the Siege of Sidney Street. Malatesta's cutting gear is on permanent display at the City of London Police museum at Wood St police station. While based in London, Malatesta made clandestine trips to France, Switzerland and Italy and went on a lecture tour of Spain with Fernando Tarrida del Mármol. During this time he wrote several important pamphlets, including L'Anarchia. Malatesta then took part in the International Anarchist Congress of Amsterdam (1907), where he debated in particular with Pierre Monatte on the relation between anarchism and syndicalism (or trade-unionism). The latter thought that syndicalism was revolutionary and would create the conditions of a social revolution, while Malatesta considered that syndicalism by itself was not sufficient. (see on Labor Unions, below). In 1912, Malatesta appeared in Bow Street Police Court on a criminal libel (defamation) charge, which resulted in a 3-month prison sentence, and his recommendation for deportation. This order was quashed following campaigning by the radical press and demonstrations by workers organisations. After the First World War, Malatesta eventually returned to Italy for the final time. Two years after his return, in 1921, the Italian government imprisoned him, again, although he was released two months before the fascists came to power. From 1924 until 1926, when Benito Mussolini silenced all independent press, Malatesta published the journal Pensiero e Volontà, although he was harassed and the journal suffered from government censorship. He was to spend his remaining years leading a relatively quiet life, earning a living as an electrician. After years of suffering from a weak respiratory system and regular bronchial attacks, he developed bronchial pneumonia from which he died after a few weeks, despite being given 1500 litres of oxygen in his last five hours. He died on Friday 22 July 1932. He was an atheist. He argued with Pierre Monatte at the Amsterdam Conference of 1907 against pure syndicalism. Malatesta thought that trade-unions were reformist, and could even be, at times, conservative. Along with Christiaan Cornelissen, he cited as example US trade-unions, where trade-unions composed of skilled qualified workers sometimes opposed themselves to un-skilled workers in order to defend their relatively privileged position. Malatesta warned that the syndicalists aims were in perpetuating syndicalism itself, whereas anarchists must always have overthrowing capitalism and the state, and the anarchist ideal of communist society as their end, and consequently refrain from committing to any particular method of achieving it. His arguments against the doctrine of revolutionary unions known as anarcho-syndicalism were later developed in a series of articles, where he wrote "I am against syndicalism, both as a doctrine and a practice, because it strikes me as a hybrid creature." Despite their drawbacks, he advocated activity in the trade unions, both because they were necessary for the organization and self-defense of workers under a capitalist state regime, and as a way of reaching broader masses. Anarchists should have discussion groups in unions, as in factories, barracks and schools, but "anarchists should not want the unions to be anarchist." He thought that, like all unions, "Syndicalism...is by nature reformist." While anarchists should be active in the rank and file, he said "any anarchist who has agreed to become a permanent and salaried official of a trade union is lost to anarchism." While some anarchists wanted to split from conservative unions to form revolutionary syndicalist unions, Malatesta predicted they would either remain an "affinity group" with no influence, or go through the same process of bureaucratization as the unions they left. This early statement of what would come to be known as "the rank-and-file strategy" remained a minority position within anarchism, but Malatesta's ideas did have echoes in the anarchists Jean Grave and Vittorio Aurelio. ^ Guérin, Daniel (2005). No Gods, No Masters, Volumes 1–4. AK Press. p. 349. ISBN 9781904859253. ^ Benewick, Robert (1998). "Errico Malatesta 1853–1932". The Routledge Dictionary of Twentieth-Century Political Thinkers. Psychology Press. p. 202. ISBN 9780415096232. ^ a b c James Joll, The Anarchists. Boston, MA: Little, Brown & Co., 1964; p. 74. ^ a b c d e f g h i Joll, The Anarchists, p. 175. ^ Dipaola, Pietro (April 2004). "The 1880s and the International Revolutionary Socialist Congress". Italian Anarchists in London (PDF). p. 54. Retrieved August 28, 2013. ^ "Sur les traces de Malatesta". A Contretemps. January 2010. Retrieved September 1, 2013. ^ Bantman, Constance (2006). "Internationalism without an International? Cross-Channel Anarchist Networks, 1880–1914". Revue belge de philologie et d'histoire. 84 (84–4): 965. doi:10.3406/rbph.2006.5056. Retrieved August 30, 2013. ^ Joll, The Anarchists, pp. 175–76. ^ a b c joll, The Anarchists, p. 176. ^ Carminati, Lucia (2017). "Alexandria, 1898: Nodes, Networks, and Scales in Nineteenth-Century Egypt and the Mediterranean". Comparative Studies in Society and History. 59: 127–153. ^ Misato Toda, Errico Malatesta da Mazzini a Bakunin, Guida Editori, 1988, p. 75. ^ Skirda, Alexandre (2002). Facing the enemy: a history of anarchist organization from Proudhon to May 1968. A. K. Press. p. 89. ISBN 1-902593-19-7. 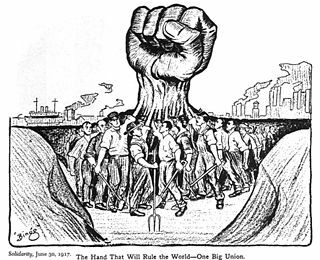 ^ “The Labor Movement and Anarchism” December 1925. Vernon Richards (ed. ), Errico Malatesta – His Life And Ideas. Freedom Press, 1965. The Radical Pamphlet Collection at the Library of Congress has materials written by Errico Malatesta. 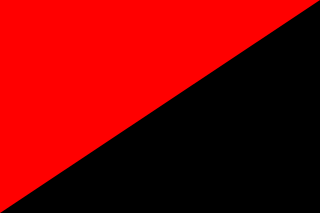 Anarcho-syndicalism is a theory of anarchism that views revolutionary industrial unionism or syndicalism as a method for workers in capitalist society to gain control of an economy and thus control influence in broader society. Syndicalists consider their economic theories a strategy for facilitating worker self-activity and as an alternative co-operative economic system with democratic values and production centered on meeting human needs. Pierre Monatte was a French trade unionist, a founder of the Confédération générale du travail at the beginning of the 20th century, and founder of its journal La Vie Ouvrière on 5 October 1909. Monatte has been considered one of the great figures of revolutionary syndicalism. Francesco Saverio Merlino was an Italian lawyer, anarchist activist and theorist of libertarian socialism. The Italian Anarchist Federation is an Italian anarchist federation of autonomous anarchist groups all over Italy. The Italian Anarchist Federation was founded in 1945 in Carrara. It adopted an "Associative Pact" and the "Anarchist Program" of Errico Malatesta. It decided to publish the weekly Umanità Nova, retaking the name of the journal published by Errico Malatesta. Platformism is a form of anarchist organization that seeks unity upon its participants, having as a defining characteristic the idea that each platformist organization should include only members that are fully aligned with the group ideas, rejecting people with any level of conflicting ideas. It stresses the need for tightly organized anarchist organizations that are able to influence working class and peasant movements.